Enphase Energy has partnered with Nest to connect your Nest thermostat to Enlighten. This feature allows you to view and adjust your Nest temperature settings directly from Enlighten. 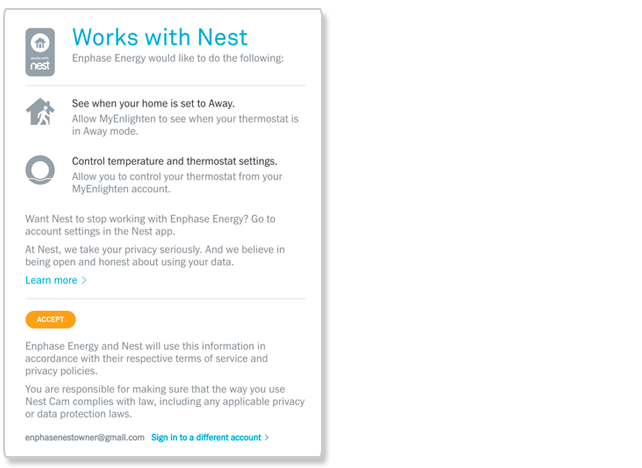 To get started, you must authorize Nest to share your thermostat data with Enlighten. In the MyEnlighten desktop application, go to the Settings screen, click the drop-down arrow next to Signed in as… and choose Settings. Scroll down to Nest Account Settings and click Connect Nest Account. This redirects you to the Nest site. Sign in to your Nest account. In Nest, click Accept. This authorizes MyEnlighten to access your Nest thermostat data. Note: If you have more than one home with Nest thermostats, select the one that matches the MyEnlighten system location. MyEnlighten displays the following message at the top of your home page if the authorization is successful. A similar message will display in the Enlighten mobile app. If an error message like An error occurred trying to connect your Nest thermostat(s) displays, go back to the Nest site and check your settings. If needed, refer to Nest help.